Vast Self Corporation’s video is capable of shattering ignorance, and delusions from all people especially those affecting the World like Mr.Donald Trump. MOUNT SHASTA, CA, USA, March 12, 2019 /EINPresswire.com/ -- Vast Self Corporation2 announced today a development of a personalized and interactive video that is capable of shattering ignorance, fears, and delusions from people like Donald Trump1. This revolutionary software consists of an interactive personalized video designed to lead Mr.Trump on 20-30 minute self-discovery adventure. 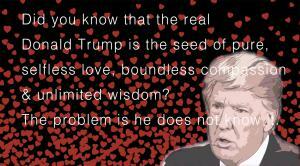 The ultimate goal of this video is to allow Trump experience his own inner self, that in the opinion of Vast Self Corporation ”the self is full of beauty, kindness, selfless compassion, unlimited wisdom, and immortality that currently is unknown to Mr.Trump”. The particular concoction of images, video, texts, graphics, and Q&A are designed to provide effortless and effective dissolution of Mr.Trump’s ignorance, confusion, fears and sufferings that come with them. At the end of this interaction, Mr.Trump will recognize his real, true, loving self that he hid from himself. Mr.Trump will have an immortal realization that the self that was hidden from him has always resided in all living beings, and that now he has the opportunity to amend for all the negativity and damages previously committed against the self in all forms. Vast Self corp. launched a campaign on crowdrise3.com to raise funds to finalize the interactive video, an iPad needed for hosting it and a secure shipment to Mr.Trump. 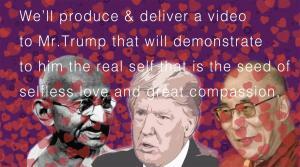 Vast Self Corporation spoke person says "The compassionate wisdom that results from this video will make Mr.Trump fully qualified to make the kindest, wisest and most considered decisions with both the domestic and International issues. This type of interactive video will soon be available to all people worldwide. The hope is to release it in as many languages as possible and asap. The kind of benefit this offers is utterly incomparable to any current educational system known in the World. Once it is watched and understood there is no more need for any further learning. The permanent personal transformation provided by this 30-minute video is worth many times more than any riches of the World." Vast Self Corporation plans to submit a very similar video to the Israeli and Palestinian authorities with intention to end this embarrassing war. Vast Self is a 501(c)(3) non-profit whose sole purpose is to restore peace and happiness in the World. This is accomplished by demonstrating how all personal and World problems can be eliminated permanently by recognizing the single reason responsible for their existence. We aim to provide educational tools that will serve all individuals, and organizations seeking permanent solutions to personal and World problems. General information about Vast Self Corporation can be obtained at the VastSelf.org. Follow @VastSelf on Twitter, and visit crowdrise.com to support their cause.